Halloween has always been one of my favorite holidays; my other favorite is Valentine’s Day. I think my favorite part of Halloween during childhood was trying to decide what I was going to be—and of course knocking on doors and collecting candy. I have a photo that my mother took at my grandparent’s house. I looked like a Mexican princess in a red lacy dress that came all the way down to my feet. She had pulled my hair back tight, red rouge on my cheeks and lips. But from my memory of that photo, I looked miserable. It must have been her costume choice. As I grew old enough to select my own costumes, I enjoyed being happy clowns on several occasions. But as I grew into my teenage years, into my twenties, and beyond, my favorite Halloween costume was always a gypsy. I used clothing that I already owned, adding my own creativity, pairing different pieces that I had bought on a whim because they were unique; and though I wouldn’t wear them under ordinary circumstances, I knew a day would come. Since I haven’t always worn much makeup, if any, I also enjoyed painting my face up with dark eye shadow around my eyes and adding other colors that would add to my gypsy look. My whole face would become a different version of myself, colorful and mysterious. I loved being able to embrace a different side of myself, a wilder side that Halloween provided the outlet for me to express. I’m not a partygoer, so I don’t dress up anymore, but because this year I’m in the spirit, I bought myself a huge clown tie that I found at the .99 cents store. I saw it a week ago and thought I’d wear it to work. That’s about as dressed up I’ll get this year. One more bonus is that my significant other and I may join his cousin and her husband to take Little A. Man trick-or-treating. He will be three soon. I hope my significant other is able to get off work in time, so we can join in the fun of Halloween from my favorite point of view—that of a child. Along the lines of tricks and treats, we are bringing Little A. Man a picture book called The Escape of Marvin the Ape by Caralyn and Mark Buehner. Hopefully he doesn’t have this one. I found the book in a children’s bookstore a few days ago. I was drawn to the large picture of Marvin on the cover and thought he might like it. The illustrations are wonderfully realistic and detailed and the writing supports each image as we follow Marvin along to the different places he visits. And if you look really close, you will see a few hidden surprise images, but you have to look very close or you might miss them. My significant other and I had fun searching for the images. Those that I missed he saw and vice versa. This may be a scattering of thoughts. I’ve felt a bit odd of synch with my blog because I’ve gone back to my personal journal pages and those have been a rambling of my thoughts. Sometimes those thoughts make their way to my blog and sometimes not. I’ve been rethinking a lot of things and I do best when I’m preoccupied and don’t have too much time to over think. I tend to sometimes allow my thoughts to go everywhere and other times they are more focused. It could be that I’m winding down or winding up, depending on how I look at it. I’m rolling along somewhat unexcitedly in my short story writing class. Yes, I have written a few scenes; and yes, I’ve written a couple of stories, but overall the experience wasn’t what I expected. I’m definitely glad that I’ve taken other creative writing courses in the past. Now, I have one more perspective to add to my collection. I think I may be outgrowing the community college course format. Mr. Squirrel I almost ran over you. when I drove the winding roads. cheeks filled with nuts. You started to run. that you made it across. bound for your winter home. Have you checked out the iTunes U Apple App? They have a large selection of free course material from different universities that you can access. I’m currently enjoying a course: History of Children’s Literature through La Trobe University in Australia. The instructor is David Beagley. In this particular course I only have access to the audio, but I have enjoyed what I’ve listened to so far. Very insightful, and this is a strong area of interest for me right now. Sunday I took myself to a used bookstore to sell a stack of books. I realized that the books I was taking could easily be checked out from the library at a later time if I still wanted to read them. Because I’m on a children’s book kick, that was my mission. I just wanted to browse what was there on the shelves. I was so excited when I saw a familiar book that I had completely forgotten about: Petunia by Roger Duvoisin. I just remember the cover with Petunia on it on a red background and that’s it, so I had to buy it to add to my books. I also saw a couple other books that I wasn’t familiar that I felt were worth having. Some years ago I found myself buying an out of print children’s book from an online bookseller. There were a few other titles that I recently decided that I wanted to own, also out of print. So there I was on Sunday night, pressing the buy button, half feeling bad about the need to possess these books and half feeling what the heck, we only live once and these books may be even harder to find at some later date. I’ve managed to finish a few other books…though this month or perhaps it’s the season, or perhaps there’s a cycle I’m in and that cycle is: scattered. I imagine myself enveloped in deep gray clouds. Sitting atop a tall wall of white brick that looks onto a castle. this quiet feeling will carry me through winter. Now I have an even better reason to celebrate the picture book in November! Any type of creative expression, whether the end result is “good” or “bad” is healthy for our whole being. I am reminded of an older woman that I met years ago. Our paths crossed for one brief summer and then our paths separated and we went our own ways. She was a great woman and had quite a mind—she was a visionary, a rebel—a strong spirit that was ahead of her time. She was a retired teacher and high school counselor, jobs she both loved, yet you could hear the disappointment in her voice at not being able to make real needed change and commitment within the faculty. She was also a writer—not published, but she wrote prolifically to her muse. Toward the end of our short relationship I became drained. I realized that though I enjoyed being a sounding board for her, learning from her, and understood and empathized with her, I was becoming depleted. Her unresolved energy was rubbing off on me, and left me feeling sapped and cranky. Though, a fond memory that I take from our short acquaintance is when I shared my artwork with her one day. 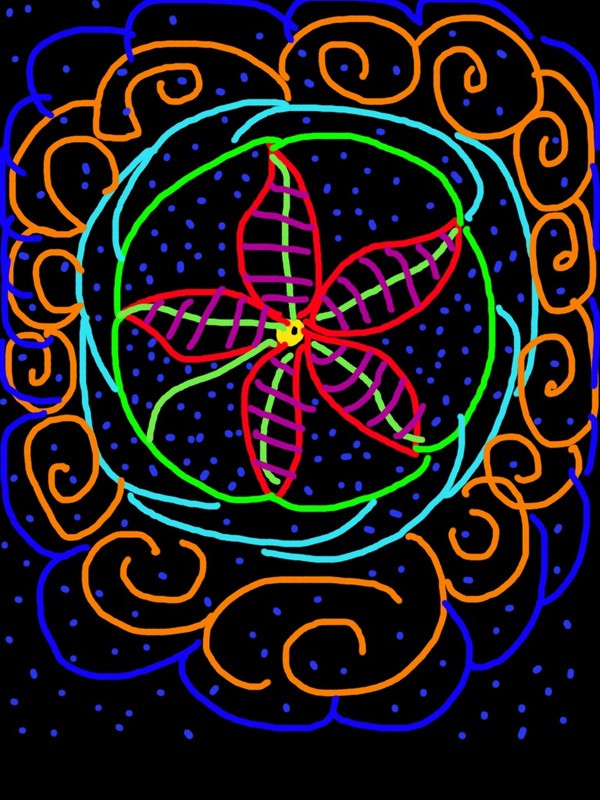 It was a mandala that I had been working on. I used drawing pastels on a blue midnight blue background. A healing energy emanated from it. She took it from my hands and admired it. She wanted to draw something too. She wanted to use her hands and imagination, reach into herself and see what would happen. Her beautiful crystalline blue eyes widened. I told her to go for it. Several days later I saw her at the coffee shop. We said our hellos and started talking. She pulled a folded piece of paper from her bag and said she had something to show me. 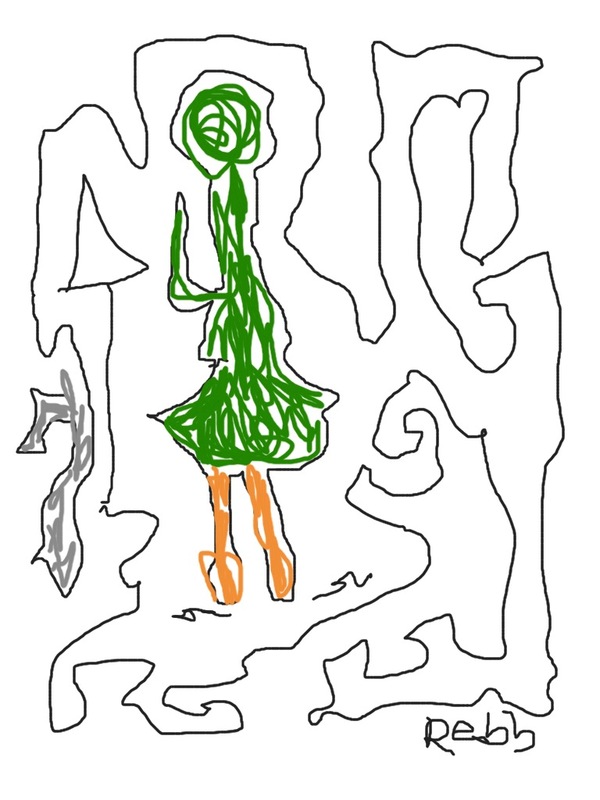 She unfolded the page timidly and there was a picture that she had drawn. I remember a sun and I remember liking her picture very much, but most important, I was proud of her for not being afraid of how childlike or how “bad” her drawing might have become as she set out on the blank drawing page that was new territory for her. 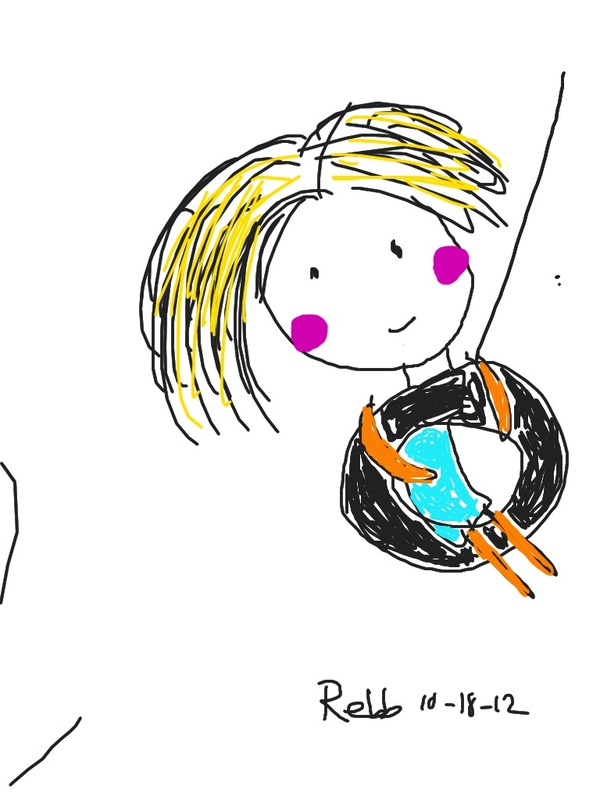 She was willing to try it, rather than say, I can’t do it, I’m no good, or I can’t draw. If we tell ourselves we can’t enough times, we will start to believe it. We can do anything we set our minds to. A large part of the joy for me is in the doing—coming to whatever task it may be, standing at the threshold, and taking that first step. There are many books in this genre that I will simply never get to, many will have slipped by, and new ones will be published at a rate that I cannot keep up with. I am most pleased when I find a storybook from my childhood that I had forgotten about until I come across the cover art in another book, a blog, or browsing the library. 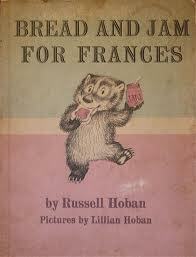 One book that recently resurfaced was Bread and Jam for Frances (1964) by Russell Hoban, pictures by Lillian Hoban. I saw Frances on the cover and I was immediately transported to a small part of my childhood. I remember the pictures and how all that Frances wanted to eat was bread and jam, yet I didn’t remember if this story was read to me or if I was able to read the words. Most definitely I was able to read the pictures, including the wonderful expressions and emotion of Frances and the Badger family. Mr. and Mrs. Badger are kind and understanding parents and that comes through in the illustration and the story. Looking at the illustrations, I also feel a calm in the artwork. Soft pencil work; the only colors used, besides the black to create the outlines and add shading, are pastel pink, pastel blue, and the white space that is not shaded in. It’s really quite lovely and I wonder if this also drew me to the book as a child. Two books that I learned about from a literacy website that I hadn’t read are Why Mosquitoes Buzz in People’s Ears (1975) By Verna Aardema, pictures by Leo and Diane Dillon; and Lon Po Po: A Red-Riding Hood Story from China (1989) by Ed Young. I’m so glad that I have experienced both. I love books from different cultures or that retell a story, as in this case, Red Riding hood. When I started to browse the library catalog looking for more Red Riding hood stories, I found that there were several versions and retellings of the story. One that caught my eye that I’m waiting to arrive at the library is a Cajun rendition. I’m very curious about that one. The version that I checked out is called Pretty Salma: A Little Red Riding Hood Story from Africa (2007) by Niki Daly. Pretty Salma is on her way to her granny’s home. Her mother tells her not to talk to strangers and to go straight to her granny’s after she picks up some things for her at the market. Along the way she meets a dog and there’s where the trouble begins. It’s a colorful story both in words and pictures with a good message for kids to remember not to talk to strangers; at the same time, the story is fun to read. Harold and the Purple Crayon (1955, 1983) by Crockett Johnson. I don’t recall if this was a childhood book for me, but what I do remember is seeing Harold and his purple crayon on one of the children’s programs that I watched. It’s a vague recollection, but when I see the cover of this book, there is something very familiar about it that triggers this television memory. I love this imaginative book and might choose it as a read aloud to bring along as a choice for when I’m paired with a student. The Pigeon Finds a Hot Dog! (2004) by Mo Willems. This is my second Mo Willems book. My first was Don’t Let the Pigeon Drive the Bus! I enjoyed that one, but found it also to be a bit odd with that strange one-eyed pigeon. But, I found The Pigeon Finds a Hot Dog! an absolute delight. It had me laughing the moment I picked it up and flipped randomly to a page in the library. I decided to check it out and am glad I did. This will be another book that I will add to my bag of books to choose from to read aloud; and even if a child has already read it, I bet they would love to read it again and again. I think I’m becoming a Mo Willems fan and that pigeon has rubbed off on me. I like him. I know Mo Willems has several other books, so I have some catching up to do and look forward to getting caught up on his other stories. My brother, who is twenty years older than I am, took me to my first baseball game when I was a young girl. It was the Oakland A’s. He didn’t know it, but I had a crush on Jose Canseco. I remember how shy I was. I remember wanting the free bag that the stadium was giving away, but we didn’t make it in time. My brother said to go ask someone if they didn’t want their bag. I clung to him. He nudged me. I started to walk towards someone, and then turned back. Then, he came with me, approached someone and they gladly gave up their free bag for that shy, very timid girl. Those were my first memories of baseball. Friday night I was watching the Giants game. I’m not a big sports fan, but I have watched baseball on and off over the years and have tuned in to the Giants, especially the past week. My significant other is a huge Giants fan and last week he said he wanted to go see them play on Sunday (today) if they made it. I said I might be interested. I’ve been to one other game this year with him, his father, and one of his cousins. It was fun. Last week at work, for our team meeting, the boss wanted to go somewhere that we could watch the Giants. They won that day! So on Friday, I watched the game, hoping they would win—and win they did. Barry Zito did an amazing pitching job and all the other players did their part. During commercials I had a small blank canvas in front of me, along with my Sharpie markers. I wanted to draw out a fall scene, but couldn’t get my ideas out. 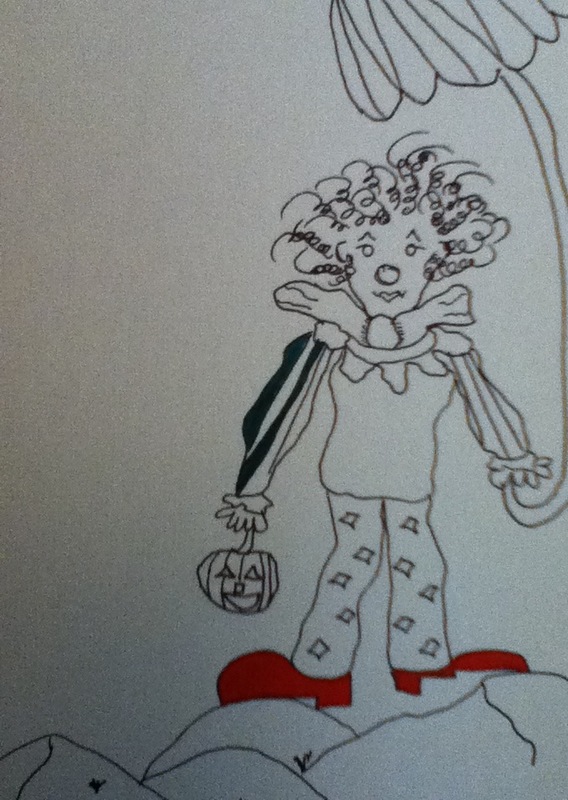 I didn’t want to be defeated by the blank canvas, then a clown popped into my head. I’ve always liked clowns and have been a clown for Halloween on a few occasions, so from my imagination, I started drawing directly on the canvas without worry. I started to color him in. I decided to keep him like that for now, but plan on filling in the color later. I like how simple he is and feel that he has a lot of color already with only the four places that I filled in. Maybe I should make him a Giants clown. Today, we’ll be at the GIANTS game. It will be an exciting day at the ballpark! I’ve been having so much fun this early morning before the workday begins. I read a few Children’s picture books that I will post to my blog in the coming days. My desire to draw has cropped up over the past several weeks and I’ve doodled a few abstract finger drawings to accompany a few of my blogs. Yesterday I was looking through one of the books I checked out at the library called Drawing Lab for Mixed-Media Artists: 52 Creative Exercises to Make Drawing Fun by Carla Sonheim. 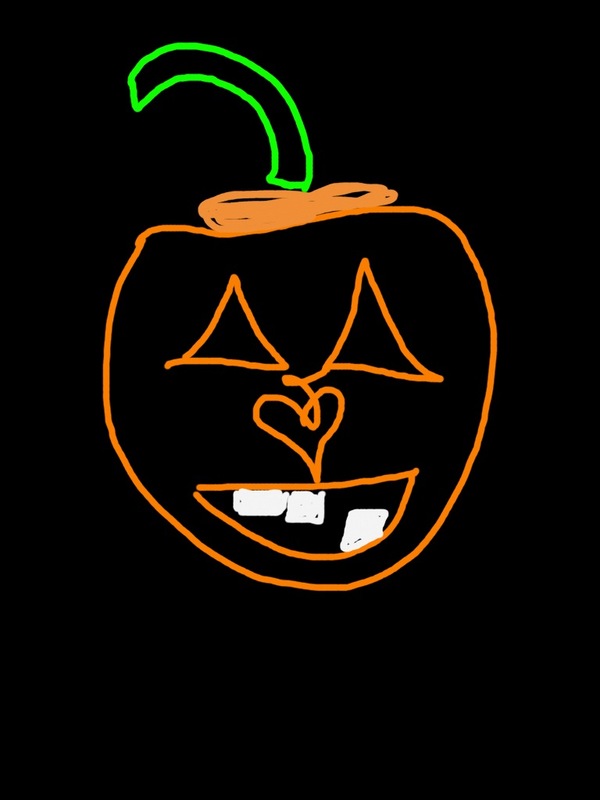 And while I was flipping through the book, I decided to try drawing one of the simpler drawings onto my Doodle Buddy App and the result is the image you see for today’s blog. It looks very similar to the original, except I didn’t color in the background and my girl actually looks happy, whereas in the original the girl looks either surprised or scared. I was thrilled at my end result. A move toward art is refreshing and a long time coming. I also checked out another astrology book from the library and have several others in route. How I love libraries! The book is called Creative Stars: Using Astrology to Tap Your Muse by Trish MacGregor. With a title like that, how could I resist? I planned to start reading it this morning, but I got involved with other books and, one book led to another search, which led me back to the online library catalog, and that led to putting more books on hold. It’s endless. And before I actually get to my job, I’m planning on stopping in at the library and picking up a few books that I know are on the shelves. I’m so excited. I love nothing more than being inside a library—and inside books. I thought that today’s happy girl picture fit in with today’s energy. I thank the author of the Drawing Lab book for the inspiration. I can’t wait to begin more doodles and get back to drawing—incorporating it into my life—and learning more. I hope that you have a wonderful day and a pleasant weekend in whichever way suits your fancy! A couple of weeks ago I started reading a book called Reading Magic: Why Reading Aloud to Our Children Will Change Their Lives Forever by Mem Fox. I finished it this morning. I was pulled toward this book because of my future volunteer work as a reading tutor for young struggling readers. I would have likely checked it out otherwise, since the topic is interesting to me. 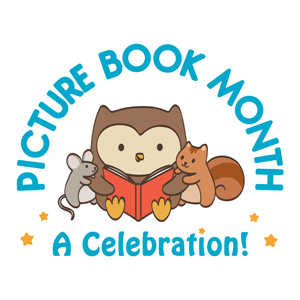 I don’t have kids myself, but as many of you know, I still love children’s picture books and check them out periodically—more so now as I love knowing that I will be sharing and learning about new picture books from this opportunity. What I found most interesting in Reading Magic is that when parents started reading to their children when they were just months old how much this impacted their reading skills as they grew older, as well as instilling a love of reading. I recently attended the training for those of us who will be tutoring. After going over the details of what we could expect, what the goals are when we sit with our students—one-on-one—as well as some techniques to help engage the children, I felt ready. But, I will remember to go into this without expectations. We were instructed to bring a few books to our first tutoring session just to be prepared, since the students may or may not bring their own books. After first learning some nuts and bolts in training, we were then paired up with a partner and took turns reading to each other from Harry the Dirty Dog by Gene Zion with pictures by Margaret Bloy Graham. I was paired with an older gentleman in his late sixties. When we were done reading, I asked him a question and it led to him telling me that he had kept all of his son’s children’s books that he had read to him when he was a child. He said that his son didn’t understand why he kept them and told him he should get rid of them. To his son, he replied, one day you’ll thank me. I told him that was fantastic and that I wished that someone had saved all my children’s books. I’ve continued to re-explore my astrology chart and have re-visited several astrology books and added a couple to my collection. I’ve looked at my houses and re-looked at my ascendant and rising sign in more detail. I definitely re-discovered insights that made sense and shed some light on things I’ve long “felt” and have known on an intuitive level. Each time I put my chart away and come back to it, it’s like coming back to it for the first time—in a way. It has been very satisfying thumbing through the different books and absorbing the information. It can be overwhelming because there are so many different pieces to look at and some authors focus more on one piece than the other. One small thing that I forget is that there is a lot of fire in my chart. I feel that fire in myself often—even without the chart. It’s all interesting to me and satisfies my quest for continuous learning in the astrology department. But, it’s almost time for me to put it away again, until next time. I finally made my first risotto—mushroom risotto—only it was from a healthy dinners magazine and was sans the butter. That must be why it had sausage in the recipe, which I didn’t care for. Next time I make it, it will only have mushrooms, onion, and garlic, and the other ingredients that make a risotto a risotto. When my significant other sees it on the plate, he only sees rice, so I’ve started calling it fancy rice with him. I’m just happy that I finally made a risotto. I enjoy ordering it when we go to restaurants that have it on the menu. Each risotto I have had has been different, as though the personality of the chef comes through on each plate. Another book that I recently purchased, and I wasn’t looking, but my eyes caught Dante’s Inferno on the store bookshelf in the same section is a small book of haiku poems called haiku mind: 108 Poems to Cultivate Awareness & Open Your Heart By Patricia Donegan. I’m savoring this one morsel by morsel. What I like is that each haiku selected by the author also has a short, thoughtful reflection on each haiku and a small bit about the author. I’ve felt inspired and further quieted by this small gift of a book. Sweet dreams…or sweet morning…wherever you are.